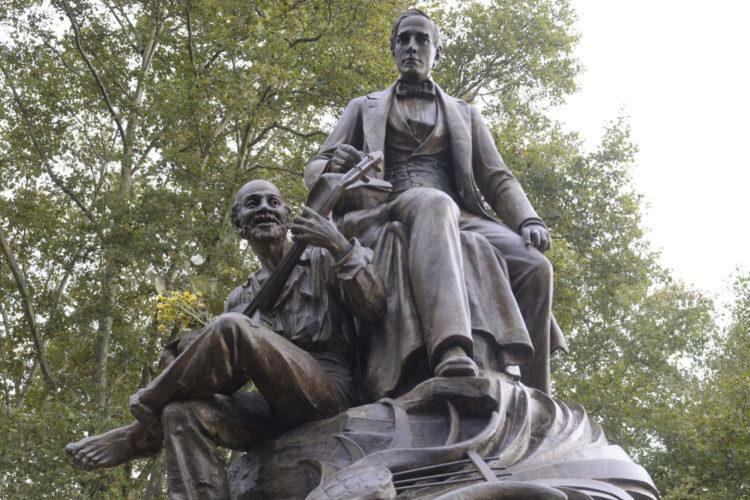 The controversial statue of American songwriter Stephen Foster was removed by the city of Pittsburgh from its perch near Schenley Plaza early Thursday morning. Sculpted in 1900 by Giuseppe Moretti, the statue has sat across from the Stephen Foster Memorial since 1940. It depicts Foster, a 19th-century songwriter known for his minstrel and parlor songs, standing while transcribing his piece “Uncle Ned,” a song about a slave. A black man sits at his feet, wearing tattered clothes and strumming a banjo. The 10-foot-tall bronze statue has been a subject of controversy for years. The City of Pittsburgh Art Commission held a public meeting on the fate of the statue back in early Oct. 2017 at the John P. Robin Civic Building in Downtown Pittsburgh, where audience members shared their views on the sculpture. The Art Commission unanimously voted in Oct. 2017 to recommend the statue’s removal. The City confirmed in March that the statue would be removed in April. Several Twitter users reacted to the removal of the statue on Thursday morning. While some people celebrated its removal, others were disappointed or angry. An ongoing effort is being led by the City of Pittsburgh’s Task Force on Women in Public Art to put a statue depicting an African-American woman at the site where the Foster statue once stood. An online poll includes abolitionist Catherine Delany, entrepreneur Madame C.J. Walker and police officer Gwendolyn J. Elliot among seven options to replace the Foster statue. The statue that will ultimately replace Foster’s will be chosen after the Task Force finishes hosting an ongoing series of community forums in order to collect feedback from the public. Three of the forums were already held this month. The fourth one will be held at the Sheraden Healthy Active Living Center in Sheraden on May 1, and the fifth at the Hill House Association in Crawford-Roberts on May 3. Both forums start at 6:30 p.m.